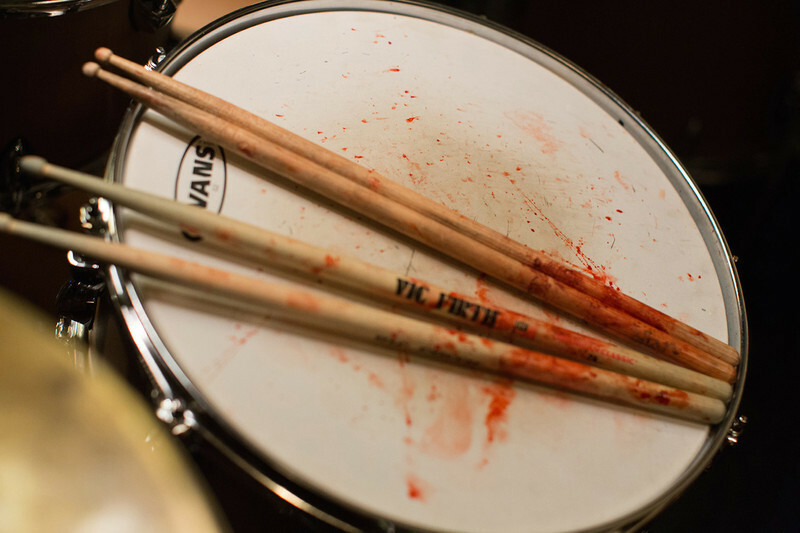 “Whiplash,” about a young drummer (Miles Teller) punishing himself in order to please a brutal teacher (J.K. Simmons) and become a great musician, is not really about jazz. Nor is it about the state of contemporary American jazz education. And it is silly to criticize it, as some have done, for being “unrealistic" in any journalistic sense. It’s a nearly great film, a twisted masterpiece of sorts, about the drive to create art, and a rare film about music that seems to have been made by someone who understands the physical experience of making music: the way players in an ensemble seem to merge with the score, the conductor, and each other when they start to cook. Its also a very good film about the specific relationship between male students and teachers who view the study and refinement of craft as an athletic event as well as an creative one: a public demonstration of tenacity, bravery and the ability to withstand pain. Art here becomes a thing to test oneself against, or a rock to break oneself against. You could say that this is basically a juvenile way to look at art, and you wouldn't be wrong. But you would also need to admit that something about it rings deeply and frighteningly true. Envisioning New York as a neo-Noir city of almost perpetual night, a la “Sweet Smell of Success” or “Taxi Driver,” writer-director Damien Chazelle's first feature moves according to its own intuitive emotional logic, as nightmares often do. The most intense parts suggest that the hero, Andrew, is perhaps not experiencing exactly what we see onscreen; that rather, that what we see is a projection of his tangled and hyper-intense feelings (thus the teacher’s repeated invocations of Andrew’s mother leaving his father because he was not a great writer, but “merely” a teacher, and his sick playground taunts). But these suggestions remain suggestions, ultimately, and the film is better for it. Our inability to entirely trust the factual reality of what we're seeing keeps us off balance more or less as Fletcher keeps Andrew off-balance, using mental and physical abuse to rip him free of his psychic moorings. The issue of what's “real” versus “not real” isn’t the point of “Whiplash,” just as it’s not the point when you’re having a dream, or watching a film with strong Expressionist elements (such as "Black Swan" or "The Red Shoes" or "Raging Bull," all three of which this movie plunders). What matters is that what’s happening onscreen feels real to you. That it feels true. This formulation is insidious, cruel, reductive, joyless. It turns the pursuit of artistic excellence into a referendum on the ability to endure shame, rejection, public humiliation, doubt and physical punishment. It's as singleminded in equating endurance and transcendence as Mel Gibson's "The Passion of the Christ." Nevertheless, as a indicator of future success, the ability to withstand suffering is hard to beat. It might in fact be the skeleton that supports the flesh of genius. The Unloved, Part 26: "Absolute Beginners"